Home furnishing is all about giving a personality to your living space. Your home can be best decorated by paying attention to the lighting, flooring, textures and color. You can custom build your home furnishing items to suit your décor and style. Browse through various home-decorating ideas so as to glean some simple tips on effective home decoration and furnishing. Find a home furnishing idea that suits you best! Here are few home furnishing ideas to bring a sense of spaciousness to your home. You can bring the airiness of the outside into your home. Play with the lighting so as to eliminate shadows. Shadows tend to break up a room into smaller units. Diffused and ambient lighting can help in creating an illusion of space. Use of color can give a totally different look to any room in your home. Use creams and beiges and pastels and watch the walls recede to give you more space. Smooth textures reflect light and do wonders for a room. Heavy textured flooring and walls can be used on large spaces. 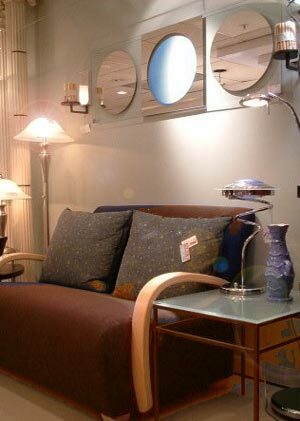 Judicious use of mirrors and chrome can also create a larger feeling within a room. Do not go in for heavily patterned home furnishing materials if you are seeking to make best use of the available space. Placement and choice of furniture can play a critical role in defining any room. Large pieces of furniture are best kept against the wall. You can juxtapose furniture, home furnishing materials, artwork and textures to best advantage and create a home that is warm and inviting. Place your chairs and sofas to create conversation areas. You can anchor them around a focal point such as a fireplace or unite the area with a bright carpet or rug. Use of incandescent lighting instead of halogen or florescent lighting can help in creating a warm atmosphere. Texture can be added by using bricks instead of glazed tiles or rugs and home furnishing materials and draperies with texture. Plants are another great home furnishing idea. Use them to advantage to add a welcome contrast to any room in your home. A philodendron or a bright fern can work wonders to a drab interior. Custom home furnishing ideas can range from Victorian or Mediterranean or even tropical or oriental. You can create custom home furnishing materials to fit into your overall theme and style. Cottage style: This home furnishing style is characterized by painted wicker furniture and a small garden of flowers and herbs. Gauzy curtains billowing in the windows and antique quilts and stoneware add to this custom home furnishing style. Mediterranean style: A home decorated in this style sees warm yellows and earth tones and simple patterns set off by blue and gold accents. Oriental style: An oriental home furnishing idea functions on the principles of simplicity and balance. Sparsely furnished with teak and lacquered furniture and oriental rugs, silk prints and dragons. traditional style: Custom home decoration in the traditional style spells of classic elegance. It sees a profusion of florals, plaids and damasks. This is set off by crystal, china and framed landscapes. Victorian style: A Victorian style of home decoration involves use of rich brocades and velvets. Porcelain and dried flower arrangements add to the overall effect. Color is an important factor when deciding on custom home furnishing. It sets the tone of the room and provides a background against which you can play your furniture and other elements. Bright colors can arrest attention whereas restful colors will provide a soothing appearance. Texture is yet another element that must not be overlooked in the overall custom home décor theme. You can mix and match rough and smooth or fine and coarse textures to achieve a wonderful effect. Balance and proportion are key elements in any home furnishing scheme. Furniture and accessories must be in proportion to each other. The size of the room is the deciding factor. Custom design your home furnishings by using richly colored fabrics and artwork to set off your overall décor. Make use of exotic lamp bases or shades and light up your room.